I’m in a holding position until another doctor’s appointment until tomorrow. Still wobbly sweaty and exhausted, which makes the grocery shopping I am going to have to do later unpleasant to contemplate. I added a raging migraine to the fun on the weekend, but figured out that it was probably lack of food, so I started choking a bit more down – more sore tummy, less sore head. Life’s all about trade-offs, right? In my deepest, darkest moments, I fear this is just the new me – that must be lack of chocolate talking. 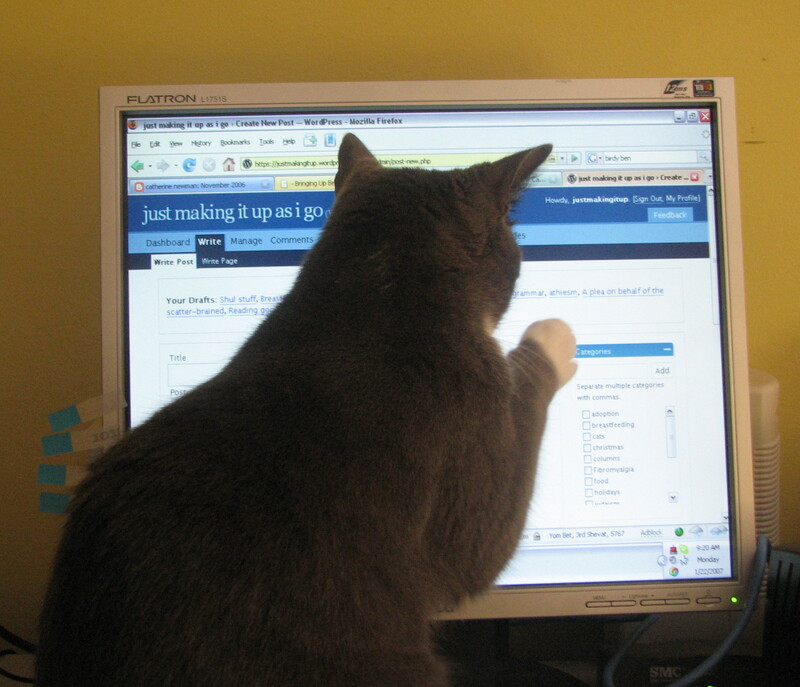 This is how I am trying to write – with the silly kitty whacking at the mouse on the screen. I spent the weekend knitting and reading, when I was awake. J took the older two skiing and the in-laws took Boo out to run errands with them (they fed her a chocolate banana crepe and she didn’t like it. Clearly not my child). Everyone is being very nice about picking up the slack while I blob about. Thursday, a good friend (such a good friend that she has a car seat permenantly in her car, but no children of her own) picked the crew up from school, took them home and fed them dinner, while I slept. I read Waiting for Birdie. by Catherine Newman. She kept a blog/columns at babycentre. If you want, you can just sit and read through them all there – you get pictures that way too – but it you want to just lie in bed and read, reading the actual book works better. I loved this book and I hated this book (I’ll get to the hate later). I’d highly recommend it, because pretty much everyone else will only love it. It made me choke with laughter at times, rolling on the bed with tears in my eyes. Wait, I’m going to modify my recommendation – if you’ve ever had children, you’ll love it. Maybe if you don’t have kids, you might not love it, because it is about raising small children and much of the hysterical laughter comes from recognition of a fellow-traveller. In this weekend’s Globe and Mail, columnist Leah McLaren happened to be writing about parenting memoirs and how boring they are. Well, some are boring, I agree, but my first thought was, of course McLaren finds them boring – she doesn’t have kids. Unless you actually have kids, or are in the process of trying to have them and are therefore obsessed with them, why would you read about other people’s adventures in parenting? However, if you are in the midst of parenting small children, especially if you are a woman, your appetite for this stuff could be endless. Mine is, only every time I read something like this, I kick myself for not having written it. (That’s where the hate comes in.) There is nothing remarkable about Catherine Newman and her family – one kid, then a pregnancy, then another kid. There’s no hook (which journalists call something interesting to hang a story on). No illness to cope with, there aren’t 8 embryos, she doesn’t give birth in the woods, she’s not even a single mom. Just two people having babies. The reason it is so good rests solely on Newman’s ability to write. And she’s a great writer. My daughter-in-law, who is doing her PhD in Women’s Studies at York is doing a review of “mommy blogs”. I sent her your blog address as a good place to start because of its typical subject matter and excellent writing style. I love what you do with the photos too. But the main point is that no matter how typical the subject matter, each writer has a unique perspective and a unique way of getting the point across. I like yours. BTW, the highest compliment I have received is from people who have e-mailed me after reading one of my stories and told me that although I most often write about everyday things, they find my approach interesting. I can say the same about your blogs. There’s luck in “getting discovered” so keep on trucking. I empathize with the sickness business. I didn’t realize you’ve been feeling crappy for so long! Hope you are feeling much better soon! I checked in hoping you’d be feeling better by now. Get well! !